While ABC has become the leader in having diverse and modern comedies, drama, and sitcoms, Netflix is steadily challenging them for the throne and perhaps the best example to date is One Day At a Time. A show which, just in 12 episodes, fully establishes the characters, their personalities, their goals, and by the final episode it leaves you in tears. 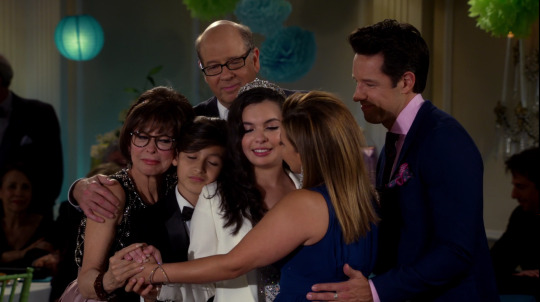 For about a year Penelope (Justina Machado) has been raising her kids Elena (Isabella Gomez) and Alex (Marcel Ruiz) with just the help of her mother Lydia (Rita Moreno) and some from her invasive landlord Schneider (Todd Grinnell). As a newly single mother, after no longer being able to deal with how her husband Victor (James Martinez) deals with his PTSD from his experience being in the military, she works hard as a nurse to provide for her kids and mother. Thankfully the man she works for, Dr. Leslie Berkowitz (Stephen Tobolowsky) is a nice guy who understands the difficulties of her being a single mom and tries to be as flexible as possible. After all, while he has two other workers, it seems Penelope’s time in the army has made her more than capable of handling his office and she is even kind enough to extend her friendship to him. Though when you get Penelope, you get her eccentric family too. Lydia is directly from Cuba and while she left her home country in a distraught state, it is still her home, her culture, and while often vivacious, memories of what she left behind hurt. Yet, seeing her two grandchildren smile always bring her back to her happy place. Be it her grandson Alex, who is very much into his appearance, cello, baseball, and video games, or her very weird granddaughter Elena. The 14 going on 15 year old is a social justice warrior, very much about the environment, and while this is generally accepted, since she has been this way since she was a toddler, she discovers something new about herself worth fighting for. Though you can find out what that is by watching the show. One of the things I love about this show is how Penelope’s family, especially her mom, are outspoken when it comes to their heritage. Often times, it seems that a character’s culture is used to lampoon the culture and to make fun of them. However, for this show, as much as you could see a stereotype here and there, you get a sense that said character isn’t made out to be a joke. Take Lydia. She brings up either religious or being Cuban in every other line, yet it never gets old or makes you want to roll your eyes. If only because, when it comes to Cuba, she talks about the good and the bad. Then with religion, it isn’t treated as something no one can refute and things of that nature. Everyone is allowed an opinion and you know it roots from the way they were raised and how that coincides with the freedoms of being in America. Leading to some complicated issues in terms of sexuality, dealing with being a person of color, and what is tradition vs. exploring what the world has to offer. There is no such thing as a dull character on this show but, at the same time, it doesn’t feel like you are presented caricatures or over the top performances either. Granted, Lydia is a hot mess but you grow used to it. You come to learn that Moreno doesn’t play her like she does to be like how Sofia Vergara plays Gloria. She is not a comic relief. She isn’t an actress trying to use Cuban and Caribbean culture as something to see as foreign and laugh at. She is giving you her sense of Lydia’s realness. Her sense of a woman a certain age who has lived a life which had some hard times and loss, but can still very much be happy. This roundedness spreads to nearly everyone. Penelope is a mother, a soon to be ex-wife, a nurse, and also a veteran. Each component brings a different side to her and while the show uses frustration, with a comic spin, too often times show the difficulties of any one of the characters lives, never are we taken to the point of forgetting these actors are trying to present a human being. Not someone to make you laugh, cheaply make you cry, or simple entertain you, but to normalize the idea that people like Penelope, Lydia, Elena, and Victor exist. It’s just, you may not be used to seeing them. One of the things which I’m not fond of with this show is that in the pursuit to normalize or present some issues as universal, it rushes through topics. Part of the reason I recognize being this is a comedy, much less one with 12 episodes, and perhaps one of the few with a Hispanic dominant cast. So with that, there is this need to bring up the issue of having undocumented parents, affirmative action, dealing with homosexuality in Caribbean cultures, and a slew of other things. All because, you don’t know if you’ll be the first and last, for some time, to actually touch on these issues. However, in the rush to normalize the characters’ issues, yet present a perspective unique to Hispanics, Cubans, or Caribbean people, it makes it so storylines you feel deserve real attention and time, they are just thrown out there. Maybe perhaps to be developed at a later time or just mentioned out of personal obligation. I’ve been seeing .gifs for this show on Tumblr for a good month now and .gifs sometimes can be like movie trailers. At times, they can seemingly give you all the best parts making it where seeing the actual movie or show is redundant. Other times, they present only a few selected highlights. With One Day At a Time, the length of your average .gif, or .gif set, could not encompass all this show offers you. For while it may avoid, with a few exceptions, even getting too deep on a particular topic, as much as this show can be funny, and have this zany and exhibited characters, we are never allowed to forget their lives can be that of actual people. For with every laugh, there is a sad memory, and with every smile, there is a disappointment. For, no matter which character is on screen, you realize they are just taking things one day at a time (I know, corny way to end a review).